Reproducing the properties of observed galaxy cluster mergers is an essential task for numerical simulations. This is especially the case if quality data exists in a number of wavebands. Reproducing specific mergers aids in the interpretation of observed data and helps to constrain models for the underlying physics of the cluster galaxies, gas, and dark matter. 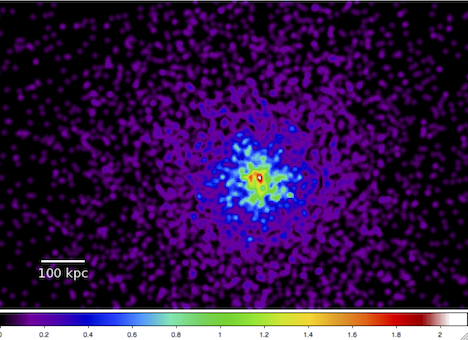 Figure 1: Mock counts image of our simulated clusters. In this vein, I performed simulations of the cluster Cl0024+17, which is believed to be a high-velocity merger of two clusters that is occuring along the line of sight. This interpretation is supported by optical (Czoske et al 2002) and X-ray (Ota et al 2004) data. The former indicates a superposition of two distinct groups of cluster galaxies in redshift space, separated by a relative velocity of ~3000 km/s. The latter indicates a superposition of two X-ray surface brightness components. In ZuHone et al 2009a, using mock Chandra observations (Figure 1), we showed that in such a merger scenario the X-ray surface brightness profile of the system is much better fit by a superposition of two cluster model profiles rather that one (Figure 2). Using these profiles and the temperature profile of the system, we showed that (in accordance with observations) the estimated hydrostatic mass of the system is accurately determined (to within ~20%) by assuming the existence of these two components, which is also in accordance with the existing X-ray observations and the weak lensing mass reconstrction of Jee et al 2007. Figure 2: Model fits to our clusters' surface brightness profile. Left: One model fit and residuals. Right: Two-model fit and residuals. The weak lensing mass reconstruction of Jee et al 2007 suggested the existence of a "ring" of dark matter surrounding the system. They suggested that the ring feature could be the result of such a collision, and produced a cluster merger simulation which resulted in the formation of a dark matter ring when viewed in projection along the merger axis. To determine under what conditions such a feature would form, in ZuHone et al 2009b we performed a suite of simulations of the merger scenario for Cl0024+17, varying the velocity anisotropy of the dark matter particles. We found that distinct dark matter rings only formed when the velocity dispersion tensor of the dark matter particles was highly tangentially anisotropic (Figure 3). This is in strong conflict with simulations of the formation of dark matter halos from cosmological simulations, indicating that an explanation is lacking for the formation of the suggested dark matter ring in Cl0024+17. Figure 3: A dark matter ring forming in a cluster merger collision where the particles have initially mostly tangential velocities.